Physical therapy billing and coding consists of diagnosis codes (ICD-10) and treatment codes (CPT). The ICD-10 selection tells the payer “here’s the diagnosis” and the CPT code tells the payer “Here’s the treatment – and what you need to pay for”. The Current Procedural Terminology (CPT) code set is a medical code set maintained by the American Medical Association through the CPT Editorial Panel.The CPT code set (copyright protected by the AMA) describes medical, surgical, and diagnostic services and is designed to communicate uniform information about medical services and procedures among physicians, coders, patients, accreditation organizations, and payers for administrative, financial, and analytical purposes. A CPT code is a five digit numeric code that is used to describe medical, surgical, therapeutic, radiology, laboratory, anesthesiology, and evaluation/management services across the entire spectrum of medical and rehabilitation billing. In this article, we will focus on physical therapy CPT codes as they pertain to physical therapy billing and coding. The complete list of the most common physical therapy CPT codes is very extensive, and we have done the hard work to analyze and compare medical billing software, so that we can present you with digital download file that you can access immediately, for free. If you like, you can click the ‘Download Now’ button below to get an email with a printer-friendly version of the most commonly used physical therapy CPT codes. If you’re more interested in diagnosis codes, check out the resource on the physical therapy billing and coding cheat sheet, a guide to physical therapy ICD-10 coding. The diagnosis sets the stage for documentation and reimbursement. Click the icon to learn more about ICD-10 coding and download a billing and coding cheat sheet. The right documentation, to justify the use of the most appropriate CPT codes puts you in the best position to get paid for your services. Click the icon to get examples of physical therapy documentation templates and best practices with physical therapy forms. The right billing and coding team will help you maximize reimbursements. Click the item to discover how to find and screen medical billing companies to help you collect the maximum possible amount from insurance companies. Physical therapy CPT codes reflect what was done for that visit, and are an indication to the payer, saying “pay me for this work done”. The clinician must select the most appropriate CPT code for that encounter and make sure that documentation is compliant, and supportive of the codes that are billed out. The best way to justify physical therapy coding with CPT codes is to enter supporting documentation in the flowsheet. A flowsheet should be more than an exercise log. It should be a complete summary of all services rendered (procedures and modalities), duration of service (used to calculate units), extent of services rendered (repetitions, sets and duration) and supporting documentation to justify services rendered. With In Touch EMR, supporting documentation in the flowsheet can be made mandatory, improving physical therapy billing and coding compliance. Comprehensive notes from the clinician enable auditors and payors to verify that the clinician is meeting or exceeding medical necessity for that visit. The flowsheet is the foundation of physical therapy billing. It reveals not only what the clinician is doing and what the clinician is billing out, but also why it is being done. In the absence of supporting documentation on the flowsheet, payments for services may be withheld or recouped by payers. Every time that the patient is seen, it is important to enter supporting documentation to justify the ongoing medical need for therapy services. The question “Why are you continuing to see the patient?” has to be answered conclusively with every flowsheet. Meeting medical necessity is an ongoing process. As a physical therapy billing best practice, supporting documentation should be distinct and unique for each visit. Physical therapy CPT codes may also be associated with two digit modifiers, used to clarify or modify the description of the procedure. Adding a modifier to a CPT code line item is saying to the payer “There are some special circumstances related to this treatment, and these codes provide more information and / or impact the payment for these line items”. 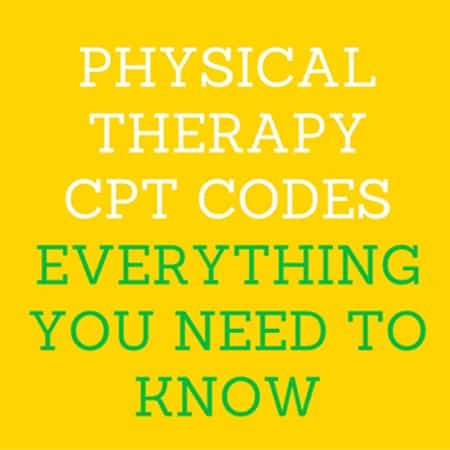 There are two types of CPT codes used in physical therapy coding: time codes and untimed codes. Physical therapists bill one unit for the first 15 minutes of treatment for most timed codes. Additional units can be billed based on the duration of the treatment time. The longer the treatment time, the higher the number of units that can be billed. Untimed codes are generally billed once per day. If the treatment area is different and the treatment purpose differs, then the clinician or the physical therapy coder can bill the untimed codes more than once (with appropriate modifiers like 59, 76 or 77 to prove that the second billed CPT code is not a duplicate of first billed same CPT code). In the same 15-minute (or other) time period, a therapist cannot bill any of the following pairs of CPT codes for outpatient therapy services provided to the same, or to different patients. 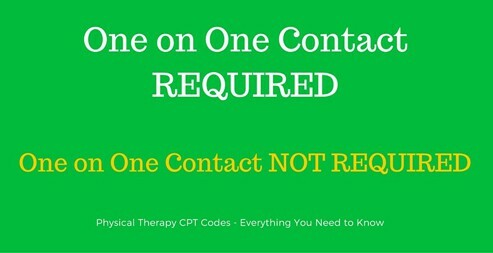 Any two CPT codes requiring either constant attendance or direct one-on-one patient contact – as described above – (CPT codes 97032- 97542). In the same 15-minute time period, one therapist may bill for more than one therapy service occurring in the same 15-minute time period where “supervised modalities” are defined by CPT as untimed and unattended — not requiring the presence of the therapist (CPT codes 97010 – 97028). One or more supervised modalities may be billed in the same 15-minute time period with any other CPT code, timed or untimed, requiring constant attendance or direct one-on-one patient contact. However, any actual time the therapist uses to attend one-on-one to a patient receiving a supervised modality cannot be counted for any other service provided by the therapist. Most physical therapists believe there are only a handful of cpt codes that can be billed out by physical therapists. The fact is, there are almost 600 physical therapy cpt codes that can be billed out. However, it is true that a small number of them (approximately 30) are the most used physical therapy cpt codes. They are listed in green, and in blue below. Before you review this list, please note that physical therapy billing and physical therapy coding practices vary from one clinic to another. As a clinician, you always want to bill the most appropriate CPT codes for that encounter, and your clinical judgement and supporting documentation should justify the use of the physical therapy CPT codes that are being billed out. We have tried to make this list as comprehensive as possible, but we recommend you identify the specific CPT codes that are applicable to your practice and conduct your own research as well. This is a total of 604 CPT codes. You can download the entire list of the most commonly used physical therapy CPT codes by clicking on the button below. The selection of these CPT codes is very important, since it reflects what procedures / modalities were provided for that visit. This determines how much you get paid. Therefore, it is crucial that you bill out the most appropriate CPT codes at all times. CMS 1500 form modifier requirements as of Jan. 1, 2014 require that all therapy codes billed on the CMS 1500 form must use modifiers consistent with Medicare rules to distinguish the discipline of the plan of care. The GP modifier indicates services delivered under an outpatient physical therapy plan of care and the GO modifier indicates services delivered under an outpatient occupational therapy plan of care. In reviewing the above list, it’s easy for CPT coding to become a bit overwhelming. That’s why it’s important to have physical therapy billing and coding specialists working to ensure your claims are properly coded (in fact, many physical therapists under-bill their services.). It is also helpful to download and review the entire list of the most commonly used physical therapy CPT codes. Click here to download the complete list of physical therapy CPT codes. In Touch Billing provides billing and coding services with an expert team of physical therapy coders. In Touch Billing has an average first pass rate 8% higher than industry standard, with costs averaging 2% lower. Schedule a discovery call today to get your no obligation billing quote from In Touch Billing. In Touch Billing is one of the few medical billing companies offering unlimited support via phone, email and live chat, and we guarantee to lower your medical billing costs, and provide you with outstanding customer service. Click here to schedule a free ‘billing strategy’ call with the experts at In Touch Billing, or call (800)-421-8442 to learn more.